Meituan-Dianping seeks Hong Kong IPO in September, too big to raise venture capital? Meituan-Dianping and its bold expansion plans. Chinese unicorn Meituan-Dianping is in talks with underwriters for a Hong Kong float that could happen in September, according to people familiar with the matter. Previous media reports, citing sources, also reported Meituan’s much-expected IPO in this year but didn’t specify a time. The move came in the wake of the company’s recent venture into two hotly competed sectors through the acquisition of Mobike, China’s top bike sharing startup, and the rollout of its very own ride-hailing business to challenge Didi’s dominance. Too big to raise venture capital? Formed via a US$15 billion merger back in 2015 based on Beijing-based Meituan and Shanghai-based Dianping, respectively modeled after Groupon and Yelp. The company today has successfully evolved from the “Groupon+Yelp” combination to become a “super-app” offering any thinkable online-to-offline lifestyle services in China ranging from group-buying deals, travel packages, food delivery to ride-hailing. Citing a recent Bloomberg report, the company has handled up to $57 billion worth of transactions last year – serving active buyers up to the size of the American population and more than 4 million merchants. The Beijing-based unicorn has raised a total of $ 8.3b to date, given its bloated size and business scope and lofty valuation, there aren’t many choices for them when it comes to raising further capitals from local venture capitalists. WANG Xin, co-founder and CEO of Meituan, was said to be in talks with SoftBank’s Masayoshi Son in seek of capital injection. Mr. Son’s SoftBank is the world’s largest tech investor. However, the attempt ended in vain, according to people familiar with the matter. Earlier last month, Chinese biztech media 36Kr, our parent company, heard from sources close to Meituan that the company was looking to raise up to $ 3 billion at a $40b valuation from private equity. Meituan later denied the report. With rumored failure to raise from SoftBank and dim hope in local VC fundraising, it seems that Meituan has to turn to IPO to support its bloated body and ongoing business expansion. Badly in need of war chest? In China’s internet space, Meituan probably has the most enemies due in large part to its expansionist nature. Starting from a group buying pure play, Meituan has expanded itself into the world’s largest on-demand lifestyle services empire, premising its businesses on the following main pillars: 1) food delivery, 2) travel booking, 3) movie ticketing, as well as new initiatives 4) bike sharing and 5) ride-hailing. In each of the above sectors, Meituan is fighting an uphill battle with one or even more major rivals. For instance, in fast-growing food delivery sector, Meituan locked in horns with Alibaba-backed Ele.me. In travel booking, there is a long-standing market leader Ctrip and a large group of smaller players. Movie ticking, Alibaba’s Taopiaopiao. Bike-sharing, Ofo. Ride-hailing, Didi. Meituan’s latest venture of acquiring Mobike, one of the top two Chinese bike sharing services, was received with some investors criticisms. In Meituan’s defense, it claims the acquisition will help the company to develop and complete its services ecosystem. Once a consumer booked a restaurant or a movie ticket on its app, without the need of turning to Didi or Ofo, the customer could immediately hail a car or find a bike from Meituan-Dianping app. Meituan’s claim might be sound, but it has one catch. 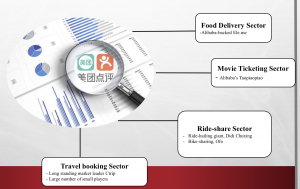 Almost all Meituan’s businesses, from movie-ticketing and online food delivery to newly-acquired/launched transportation, are costly and heavily subsidies-driven, literally cash-burning, especially in the two transportation sectors it just dipped toes into. In the ride-hailing sector, Didi currently operates 90% of the trips in China and is heavily funded by a long list of investors including SoftBank. Meituan would have to prepare a huge trove of war chest if the company is serious about a landgrab with Didi. As to bike-sharing, with the sellout of Mobike and Ofo’s funding dilemma, the business has been questioned as whether it is even a valid business model. Making money from bike sharing seems to be mission impossible in anytime soon, let alone Meituan has taken over Mobike’s outstanding debt from the acquisition. To support its traditional businesses’ day-to-day operation, to keep expanding into new territories, to fight a uphill battle with all its competitors on all fronts, these all require the support of large funding, and now with a too bloated size to investors, Meituan might have to – just as rumored suggested – to resort to public market to keep funding its expansion and ambition.